Throughout the entire Governor Walker saga the GAB (Government Accountability Board) has shown its true colors as a partisan, left leaning group of retired judges. Almost every ruling to come out of this body has been against Governor Walker or one of our brave GOP legislators. Well this week the GAB has taken this tired act over the top and has not just attacked our Governor, they attacked all Wisconsinites everywhere. This weeks ruling by the GAB that only the official campaign of a particular candidate can challenge recall signatures flies directly in the face of our rights. Why does one have to be part of a particular group of people in order to be sure their rights and their vote are protected? What about independents, Libertarians, and common sense Democrats who support Governor Walker or one of our brave GOP State Senators? Are these people not allowed a voice in this recall attempt? Why does the GAB feel the need to strip them of their ability to participate in the political process. Make no mistake here, our liberties are under attack by a rogue unaccountable entity that puts its ideology ahead of its responsibility to the citizens of Wisconsin. The Left scoffs at the notion that Pro Walker people are attempting to verify the recall. They call it a waste of time. They have come up with a ton of crazy excuses not to allow people access to public records. Hey if you are willing to negate the votes of 1.1 million voters who voted for Governor Walker in November of 2010, you should also be willing to proudly display your name and address. This is not a game lefties so stop treating it like one. The anti Walker crowd laughs at our attempt to validate signatures, they say there is no way we can throw that many out. Honestly I agree with them that we will not be able to find enough fraud to stop the recall election of Governor Walker, but that does not mean we do not have the right to try. This is not about throwing out enough signatures to negate a recall, it is about Wisconsinites being allowed to be part of the process. It is about making people feel that the process has been fair which in turn will make people feel better about the outcome, regardless of what the outcome is. 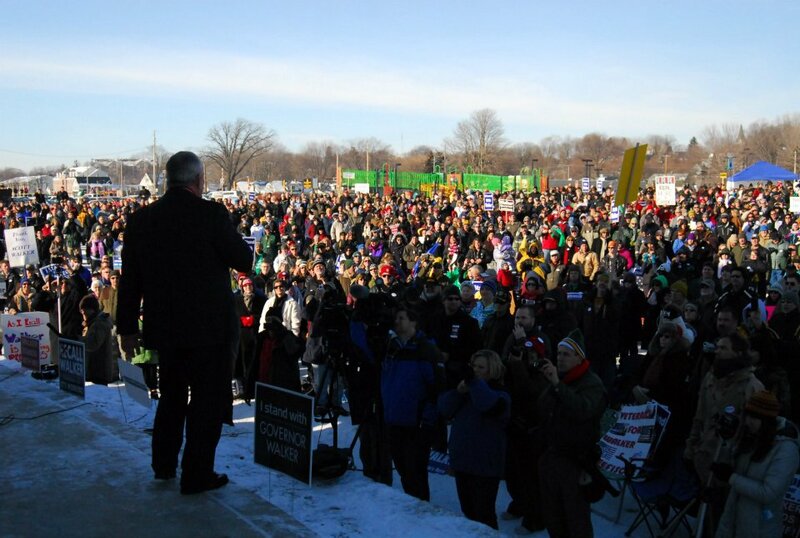 I was there in Madison and I saw all the out of state semi’s around the Capitol the day the recall started. Why do out of state unions have more of a voice in Wisconsin then its own citizens? GAB if you want Wisconsin to truly heal when this is all over, you must allow Wisconsinites to be part of it or else neither side will accept the outcome and we will be divided forever. As for our friends on the left who are celebrating the GAB ruling. Know you are celebrating the erosion of your rights as a citizen of the state of Wisconsin. Know that rulings create precedent so do not be surprised when these issues work against you and your movement one day. At the end of the day you all are having a hissy fit over losing some collective bargaining privileges. Trust me when I tell you if this ruling from the GAB stands, you will lose a lot more than access to free healthcare, you lose your voice. Think about it, is this truly what you signed the recall petition for? Today is President Ronald Reagan’s 101st birthday and though he is no longer with us, his legacy lives forever in the hearts and minds of conservatives across the country. He was without a doubt, the biggest influence on my politic beliefs and I owe my conservative principles and core to him. President Reagan was everything you wanted out of a President. He was the eternal optimist and he never took no for an answer. It is said that the times make the man, but in President Reagan’s case the man made the times. He put in motion the forces to tear down that wall in Berlin. He made people feel better about America again which helped get us out of economic funk in the early 80’s. He created the conditions that allowed businesses to reinvest in themselves that allowed for great inventions like the internet etc…America owes President Reagan a serious debt of gratitude. Conservatives like me have been waiting many years for our next Ronnie. Taking a look at the political landscape today you can find a few conservatives as smart or as witty or as charming, but you cannot find anyone who has the total package President Reagan did. Many people believed it took a President Carter to bring us a Ronald Reagan. If that is indeed the case where is our Ronald Reagan to take on the one President Obama? I can tell you he or she is not among those currently in the race. That is the one sad part of the Reagan legacy, the lack of someone to pick up where he left off. With the Democrats prospects of taking over the Governor’s mansion in Wisconsin dimming they seem to have shifted their focus to regaining control of the State Senate, where there short-term prospects look a bit better. Here is the fly in the Democrats ointment, even if they manage to win one or even two of the Senate recall elections, their stay in control of the Senate will be short. I am not trying to blow smoke up anybody’s backside here, at least 2 of the upcoming Senate recall elections are going to be dog fights. Both Sen Wanggaard and Sen Galloway are freshman Senators so they have had little time to bond with their constituents. Senator Galloway is in a bit better shape based on the demographics of her district, but she is still vulnerable. Senator Wanggaard represents perhaps the purplest district in the state and he will be the Democrats number one target. Fortunately for conservatives, Wanggaard is a tireless campaigner and the conservative grassroots in his district are well-organized. It also helps that the Democrats have decided to run a re-tread against him. As much as I would love to state that we will win all 4 Senate recalls, conventional wisdom and the results from last August tell me that at least one of our brave GOP Senators will lose. While that would be considered a short-term victory for the Democrats, their long-term prospects of holding on to the Senate majority after the November elections of 2012 do not look good at all. Lets for the sake of argument assume they win one of these recalls to regain control. Under that very possible scenario lets examine the actual Senate races of 2012. There are 16 State Senators up for re-election in 2012, 6 Republicans and 10 Democrats. Based on Wisconsin’s newest electoral map all 6 of the Republicans are safe with Senator Olsen being the most vulnerable. On the Democrat side I see 4 seats in play. Jessica King , who just won her Senate seat in the last round of recalls is in real trouble. Senators Holperin and Hansen both survived recall bids against political unknowns last August but based on their districts they have to be considered vulnerable and last but not least Senator Wirch, who to his credit keeps on winning, is always a target for defeat. It is way to early to make any bold predictions but one look at this scenario tells me that the GOP will pick up at least 2 of these Democratic seats in November and once again regain control of the Senate. In the meantime lets all work our tails off for our recalled Senators so next November we will be increasing GOP control instead of winning it back. I get it guys, we have been taking on the chin for the past year in the media and on the ground. The Left in Wisconsin is very good at staging a production and with a lot of outside help, they set the tone for the past year. What I am here to tell you is that while we must remain vigilant and at the ready, we are indeed winning this argument with the people who count the most, independent voters. The recently released poll done by Marquette University shows just how much of an advantage Governor Walker enjoys right now. The fact that he is beating Kathleen Falk by 7 points is promising. The fact that he doing that well in a poll where Obama is winning by 9 points makes it impressive. It is also important to note that he is polling at or over 50% against almost any challenger which is a great sign for an incumbent. Add to that his 51% approval rating and you have every reason to believe that come this time next year that Scott Walker will still be our Governor. Perhaps the biggest telltale sign of Walker’s huge advantage can be found in what the Democrats are not doing. Sure they made a big deal out of handing in the signatures but have kept real quiet since then. It is also hard not to notice the fact that the big players in Democratic politics in this state have not stepped up yet. Where is Tom Barrett? David Obey why aren’t you announcing your candidacy yet? Could it be that your internal poling has shown the numbers are not there for you to win? If they are pinning their hopes on Kathleen Falk, then you know they truly are in trouble. At the end of the day this election will come down to 2 things: turnout and independent voters. We know our turnout will be great as it always is and if the current trend continues we can count on our independent minded friends to carry us to victory. Do everything you can to make sure we keep the Governor of the year Scott Walker in office, and know that your efforts WILL not be in vein because we have the advantage and we are not planning on giving it away anytime soon. So go ahead and stick your chest out a bit, talk more confident about Governor Walker with your family and friends. It is really ok to feel good about your Governor and your political position in Wisconsin.